Recipe video above. This Middle Eastern chicken is incredibly aromatic. The marinade is very quick to prepare and the chicken can be frozen in the marinade, then defrosted prior to cooking. It is best cooked on the outdoor grill / BBQ, but I usually make it on the stove. Serve with a simple salad and flatbread laid out on a large platter and let your guests make their own wraps. Combine the marinade ingredients in a large ziplock bag (or bowl). Add the chicken and use your hands to make sure each piece is coated. If using a ziplock bag, I find it convenient to close the bag then massage the bag to disperse the rub all over each chicken piece. Marinate overnight or up to 24 hours. Combine the Yoghurt Sauce ingredients in a bowl and mix. Cover and put in the fridge until required (it will last for 3 days in the fridge). Place chicken on the grill and cook the first side for 4 to 5 minutes until nicely charred, then turn and cook the other side for 3 to 4 minutes (the 2nd side takes less time). Remove chicken from the grill and cover loosely with foil. Set aside to rest for 5 minutes. 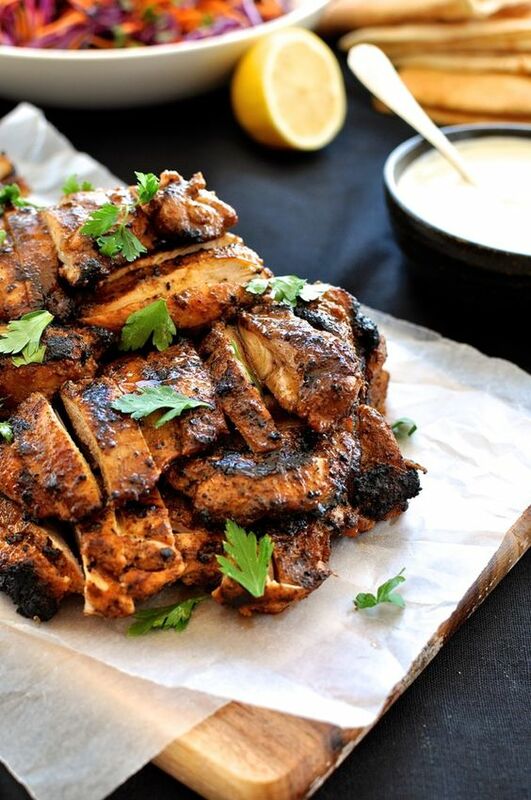 Slice chicken and pile onto platter alongside flatbreads, Salad and the Yoghurt Sauce. To make a wrap, get a piece of flatbread and smear with Yoghurt Sauce. Top with a bit of lettuce and tomato and Chicken Shawarma. Roll up and enjoy! 1. MAKE AHEAD: Pop the marinade and chicken in a ziplock bag and freeze straight away. Then as it defrosts, it will marinate! This also works well made ahead, which I recently did when I made this for 50 people as part of a multi-course meal. I grilled it in the morning and cut it up. Then prior to serving it was just heated up in the microwave. Toss it with the juices pooled at the bottom of the dish and no one will guess it was cooked earlier in the day! 2. If using large lebanese bread as pictured (diameter is almost 30cm/1 foot), you need around 300g/10oz of chicken per person (raw) to fully fill them out without tucking the ends in. 200 - 250g/7 - 8oz per person seems to be enough on average, but I always end up providing more! 3. Chicken - I use 6 pieces approx 5oz/150g each. Chicken breast: I feel strongly that this is best made with thigh because it's got more fat so you get beautiful caramelisation. But it's still super tasty made with chicken breast. The best way is to cut them in half horizontally to make 2 thin steaks no thicker than 1 cm/ 2/5" each. If needed, pound lightly. Marinate per recipe. Then cook on a high heat (not medium high per recipe) for just 2 minutes on each side until golden. They will be juicy and beautiful inside! 5. BAKING: Cooking on a BBQ or stove is best to get the caramelisation. Baking doesn't yield quite the same flavour - but still very good! Bake at 425F/220C for 20 - 25 minutes until a browned. 6. Nutrition for chicken only because flatbreads vary so much in size and calories.Assuming 6 servings.